This patch is now the Unified Thracia Project (versions 0.2.x and 0.3.x) which includes a partial script translation and the newest updates to the menu patch. 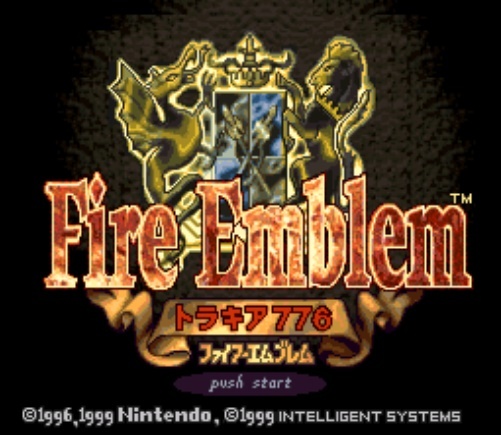 Well, let's just say my quest to play Thracia 776 turned into a bigger project than I ever imagined... After seeing what the only English patch for this game was, I decided to take a shot at making one myself, gradually figuring out what on earth I was doing as I went along. Now that I've played through the whole game using this translated interface, I think it's ready to come out of the shadows (also because my life's about to get a lot busier). I'd say it's beta-quality, thoroughly tested by me but not perfect. Made it ignore the checksum on save files (this was really just for my convenience, but I'm sure others could find it useful). But of course, I understand not everyone wants these side effects just to play the translated game. The current release includes two separate patches for single and double RNG, and I plan to make the graphical mods optional in the future as well, but they're in the patch for now. The major issue with the patch at this point is that a lot of the text rendering is throttled and doesn't appear instantly, although it still appears quickly enough that it never bothered me while playing. There's a little flickering in some unusual situations too, but you won't see a lot of it. This is all a consequence of DMA/HDMA conflicts with the gradient window backgrounds. So what now? After everything I've figured out about the game's programming, there are so many cool hacks I think I could do with enough time and effort, but unfortunately I don't think I'll ever be able to. This project was sort of an anomaly that I poured all my effort into while unemployed, but I have a busy life again with higher priorities, and lack the spare brainpower and time to put into it. I'm determined add the script though to have a complete translation of the game, so you can expect that much at some point. Really looking forward to the 1RN version, as weird as it sounds! I'd like to experience the game in its original janky glory. I LOVE this. The text is very clean and the map sprites look awesome. I'd like to see more of your work on this project. Splendid idea. Maybe we could all be impaled on the same lance. You sir are are a great person. I'm not too fond of introducing new RNG because the charm of Thracia 776 is having no consistency but I respect your reasons. I'll play it ASAP. EDIT: Is Elite mode in automatic or am I playing too fast? Leif gained like 34 exp from a common soldier. So what did you use to make this? Oh man this is awesome thank you so much for your hard work! I'v beaten Thracia several times and now I will know whats being said! I really hope you decide to do a script because your work on the menu's are amazing and clean. Especially if its easy to insert for you I really hope you decide to do the script as well. Thanks again for your hard work! Good. Then let us commence our offense. Is this patch only applicable to the NP version of Thracia? The screenshots indicate that it's NP (1999) and not ROM (2000) version so naturally curious. Is Elite mode in automatic or am I playing too fast? Leif gained like 34 exp from a common soldier. It's not. Not sure why it would seem to be different, but I think I remember exp gain being fairly quick at the beginning of the game. Bsnes plus, TLP, WindHex, CoffeeScript/Node for generating text images and patching data into the ROM, and most importantly this patching assembler. It uses the approach of expanding the ROM, filling it with pre-rendered text, and changing the rendering routine to load that stuff to VRAM dynamically instead of using a tileset. Funny you should ask actually -- I built it using the NP version, and in the end I made the patch off of the ROM version since it seemed more common (I might be totally mistaken, not that familiar with the differences). I still need to set those straight to avoid confusion. Does this require unzipping any files? I have a feeling that's where the difficulty for me will come in. Just as I was thinking about playing Thracia again! Thanks a million! ZSNES is heavily outdated (by well over a decade) and has multiple known security flaws. Hell it can't even handle the FE4 Project Naga patch. Use something like Snes9x or higan, both of which have been updated in the last year. Just tried it in Snes9x v1.54.1, same story. Also tried it with the stable 2R version, freezes again. Patched a clean JP rom with Luna IPS. Anyone else same issue? Are you using a clean, unpatched ROM to begin with? And is it the NP or cart release ROM? I haven't tried this out yet, but it sounds like you need the latter. The title screen of the unpatched ROM would have the year 2000 on it. So I need to find cart release? Any specific search term that'll get that for me? I'm pretty sure I can't direct you to a place that has it, but if you come across a place with multiple versions of the game, take a look at the name and/or description of the file. I think you'll find ones with NP, which is the one you already have, ie. the one that doesn't work. So grab one without NP. Found one in my old stuff. Thanks so much for your help; it works perfectly now. Super hyped for when this has a storyline translation attached one day too! Menus look beautiful. I literally made an account here JUST to say thank you so much for making this. I've waited too long for something like this, and I'm pretty sure everyone else has, too. Not sure whether to continue this or not, but why not? Insert that translated story script and you'll have completely captured my respect. Is it possible to get this patch to work with the translation patch? Or can I only use one patch? I'm having a weird bug where when Karin (mounted) tries to Rescue someone without a weapon, the game does... weird things. It'll lock up if she actually does Rescue them, and if she backs out of it, the game will lock up when I try to move someone without first looking at the status screen. I can play around it, but it's pretty unfortunate. Good, but it needs the script translation to be playable.